As triathletes we spend a lot of time training, most of which is time spent swimming, cycling, and running outside. We consider ourselves very lucky to be able to enjoy the beautiful weather, terrain, and beaches of southern California. As students we also study at an academic center for environmental science, and we are very aware that climate change, resource exploitation, and short-term thinking endanger our lifestyle and communities. We also understand that most organized sporting activities are not planned with long-term environmental and social impacts in mind. Competitions bring athletes together, and sustainable competitions show athletes and the community-at-large that sports are more fun and fulfilling when environmental, socially, and physical health are considered. We direct three sustainable competitions each season. We host the Coveskipper Aquathlon in the fall, the Tritonman sprint triathlon in the winter, and in the spring we host the Grove Run trail run. The May, 2009 Grove Run was the most sustainable running race ever documented based upon our certification score from the Council for Responsible Sport and was southern California’s first documented “green race“. The UC San Diego Sustainability Resource Center provided significant support for the May 2009 Grove Run. Our green races are an example of a sustainable relationship between triathlon and the environment. Collaborations within UC San Diego and the local community helps us to develop sustainable practices we can share with other students and student groups. We often practice on stationary bicycle trainers on the UC San Diego campus. Our goal is to improve our stationary trainers with an electricity generating resistance unit while capturing information on our athletic performance. In the Fall of 2009 we worked with engineering students in Teams In Engineering Service (TIES) to design an inexpensive, reliable, and efficient renewable energy generating stationary bicycle trainer. The TIES team’s preliminary analysis will be used by another group of engineers in the spring quarter to build the trainers. We know that sustainability is a continual process and a group effort. Where possible we try to lend and accept support from other organizations and sponsors that share our values. In the 2013-2014 season, we specifically brought Spy Optic on-board as the title sponsor for Tritonman because of their similar desire to promote environmental stewardship and sustainable causes. In the summer of 2009 we professionally analyzed of our carbon footprint. Not surprisingly, the two main sources of carbon are associated with our travel to races and athletes traveling to the races we host. The May 2009 Grove Run was our first carbon restorative event, we offset twice the carbon footprint of all participant and race related travel and energy use with carbon credits. High quality carbon credits were purchased through Native Energy. At the May 2009 Grove Run we also encouraged athletes to change their behavior and 90.7% or participants offset their own race carbon footprint, 63% traveled to the race by bike, used mass transit, or walked. To improve the links our personal decisions and global environment health we challenged participants to compete to become the Grove Run’s “Greenest Athlete”. The Grove Run made our community more aware of the environmental impacts of organized sports and encouraged actions to reduce waste. Our own travel related carbon footprint is also computed for each competition we participate in. At the end of the season, our race related carbon footprint will be offset with high quality, verifiable, carbon offsets. We estimate that our carbon footprint will be between 20 and 30 tons CO2 for the season. If you are on a university campus, contact your administration and other student groups for help. At UC San Diego the Sustainability Resource Center and Sustain 2.0 provide significant assistance and encouragement. Under the framework of the UC San Diego sustainability principles we are committed to the creation of a sustainable relationship between our sport and the environment. Sustainability is a key part of our mission and we can make vital contributions to our community. We look forward to collaborations within UC San Diego and the local community to develop sustainable practices, competitions, sponsorships, and education. 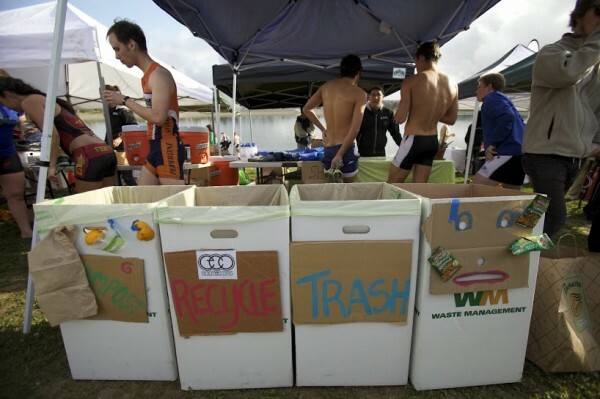 A green triathlon team is a critical component of a sustainable campus and community. We empower students to become leaders for sustainability in all-aspects of their lives.